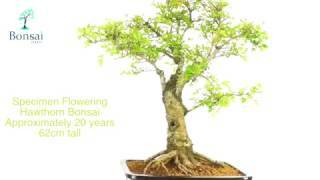 A powerful, gnarled and beautiful aged Hawthorn bonsai with beautiful root flare. It has pretty white flowers during spring followed by red berries. The bark has aged beautifully and has a distinctive silvering. The leaf shape is beautiful and very well proportioned. A cracking bonsai in a bark brown glazed ceramic pot, with perfectly compliments the lovely silvering bark. Please view the video below the main image. It shows so much more details than the photographs and you can appreciate the details on this beautiful bonsai tree. This is an incredible, powerful chunky flowering outdoor bonsai. It is very hardy and tough and has immense character. It has aged beautifully and has a craggy appearance well depicted by hawthorns. Beautiful. Pot Colour: Chocolate brown rectangular glazed bonsai pot.